Layer up and celebrate the season as you schuss and traverse your way along fresh snow on your next winter getaway. Ski, skate, snowshoe, snowboard, and sleigh ride then relax in a comfy chair while sipping hot chocolate. Where can you find stunning mountain views and relax in style after a day full of fun winter sporting activities? Guests will find the perfect amount of chill factor, both indoors and out, at these beautiful inns. Brrrrrr. There’s no escaping the fact that it’s cold outside! But you can escape to the cozy charm of Glynn House Inn, an 1896 Victorian Inn that wraps itself around visitors like a warm blanket. 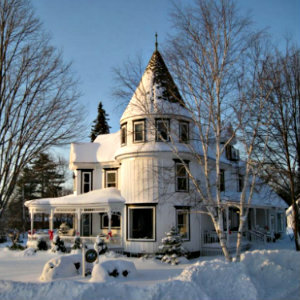 This Ashland, NH, inn, located in the heart of the White Mountains, is a snow lover’s paradise. Offering six comfortable rooms with fireplaces, inviting four-poster beds, and luxury linens, your weary bones will thank you after a day spent zip lining and ice climbing. After enjoying afternoon refreshments and complimentary wine & hors d’oeuvres in the sitting room or outside on the wraparound porch, soothe those aches in a double whirlpool bath before you retire for the night. The breakfast menu of waffles, pancakes, egg sandwiches, and muffins will help you fuel up so you can tackle Cannon, Gunstock, Loon, and Waterville mountains, which are minutes away. With a name like Adobe and Stars Bed and Breakfast Inn, stargazing is a must during your getaway. 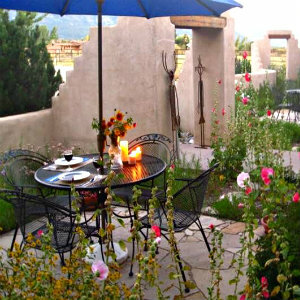 The gorgeous setting of this Taos, NM, retreat is constantly on display through the large, picturesque windows of this luxurious inn. The natural beauty of New Mexico is evident in the eight large guest rooms which feature handcrafted Southwestern furniture and art, and a kiva fireplace. Forget about your troubles as you lounge in your private Jacuzzi tub, gazing at the starry stars and inviting snow-covered mountaintops. After some much-needed downtime, pound the powder with downhill skiing at the famous Taos Ski Valley. Snowmobiling is also available through the Native Sons Adventures. This guided tour takes guests through the beautiful forest around Hopewell Lake. A day full of heart-pumping outdoor activities demands an amazing country breakfast of homemade muffins, quiche, and gingerbread waffles with fresh strawberries and homemade strawberry syrup, all enjoyed in the dining room near the fireplace. If you want to experience New England’s premier ski and ride experience, Green Mountain Inn is the perfect retreat. 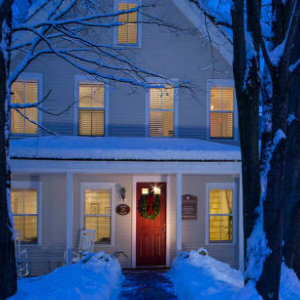 Located on Main Street in Stowe, VT, this property has 103 unique guest rooms, suites, village apartments, and townhouses that offer a lovely refuge after a day spent on the newest and most sophisticated snow-making terrain. “Stowe Mountain Resort is seven miles from the inn, and it’s the highest mountain peak in Vermont,” says innkeeper Patti Clark. The outside amenities allow you to appreciate the beautiful surroundings. Take in the gorgeous Green Mountains as you sit by the heated pool. “We have an outdoor Jacuzzi and fire pit, so that makes it perfect for guests coming back after a day of skiing,” says Patti. “Mid-week is great for skiing and it’s not as crowded.” Snow lovers, young and old alike can’t get enough of the warm hospitality and comforts inside, and the cold adventures that await them outside in this charming ski town. Your cold weather gear is warm, soft, and comfortable. The place you choose to unwind in after enjoying the harsh winter elements should be the same. 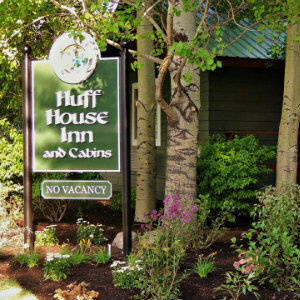 Huff House Inn and Cabins, in Jackson Hole, WY, features five cozy rooms in the main house, and three cabin suites on the landscaped grounds. There is a comfortable living room with a fireplace for warming up after a day of skiing. It also features a library with a great selection of books where guests can curl up and read in front of the fireplace or by the outdoor fire pit. Located two blocks east of Jackson’s Town Square, visitors won’t have to travel far to ski and snowmobile on the nearby mountains. When they return, the king sized four-poster bed and soaker tub will leave guests feeling warm and fuzzy inside. You can even take some of those warm feelings home when you order the aromatherapy basket that features lotion, bath salts, and bath fizzers. Many avid skiers go to bed dreaming about conquering mountain trails. 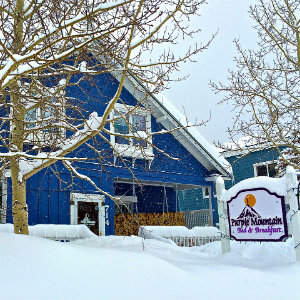 At Purple Mountain Lodge in Crested Butte, CO, ski enthusiasts can actually go to bed in a room named after a popular local mountain that they can ski down later that day! The six lovely guest rooms, The Teocalli Room, The Whetstone Room, The Twin Buttes Room, The Paradise Divide Room, The Crested Butte Room, The Red Lady Room, offer Egyptian cotton linens and luxury bathrobes. Sample the sweet treats at the hot chocolate bar and the chocolate milk station, then find a cozy corner by the beautiful stone fireplace in the sitting area and behold the lovely mountain views. The outdoor hydrotherapy hot tub is a welcome delight after an afternoon of cold winter activities. The cold and refreshing delights continue as innkeeper Christopher Haver serves up quality craft beers on tap daily. At this B&B, skiing, chocolate, hot tubs, and craft beers are all you need to make your winter getaway dreams a reality. 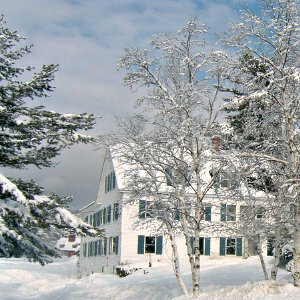 Nestled in the White Mountains of New Hampshire, 1785 Inn resembles a picture-perfect postcard of a winter wonderland. But the best snapshot just might be of you relaxing by the fireplace taking in the beauty and charm of this classic country inn that offers great views of Mountain Washington. Right outside the front door, skiers are just 60 kilometers to the groomed trails. Downhill skiers are very close to Cranmore, Wildcat, and Brettenwoods. If you’re not much of a skier, cross-country trails, sleigh rides, snowshoe, and tubing should satisfy your adventurous spirit. This entry was posted in Mountain Retreats, Specials & Packages, The Great Outdoors, Winter Escapes by BnBFinder. Bookmark the permalink.